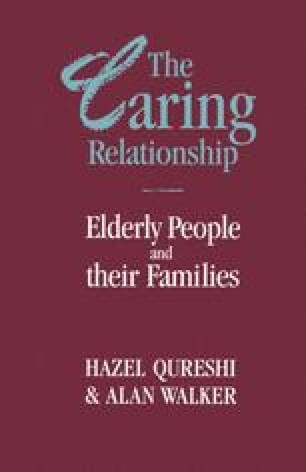 The previous chapters have explored the current state of the caring relationship between elderly people and their children. Our primary concerns were to document contemporary family relations in old age and to explore the social and emotional foundations of the caring relationship. Since the family is the main provider of care and tending to the elderly, as well as other family members in need, policy questions about the caring capacity of the community and, specifically, about responding to the rising need for care in the wake of an increasingly aged population should be addressed first to the family. Rather than appealing for increased activity to a nebulous and ill-defined ‘community’, we believe that a sound policy must be based on a better understanding of the strengths and weaknesses of family care.